Is the Obama ban a military-defensive one or an economic-protectionist one? Maybe the US law courts will be able to decide. BBC: “A Chinese-owned firm in the US is suing President Barack Obama after he blocked a wind farm deal on national security grounds. Ralls Corp, a private firm, acquired four wind farm projects near a US naval facility in Oregon earlier this year. Mr Obama signed the order blocking the deal last week. The lawsuit alleges the US government overstepped its authority. It is the first foreign investment to be blocked in the US for 22 years. The block on the wind farms comes just weeks ahead of November’s US presidential election. China’s state-run news agency Xinhua said “China-bashing” in order “to woo some blue-collar voters” was the reason for the decision. Mr Obama has been criticised by the Republican nominee, Mitt Romney, for not taking a tough enough line with China over trade and investment practices. Indeed, Mr Romney has said he will label China as a “currency manipulator” if he is elected. US politicians have long alleged that China keeps its currency artificially low giving its exports an unfair advantage and, in turn, costing the US jobs. That is denied by Beijing. But many Chinese officials are now used to the four-year election cycle when increasingly China has become the whipping boy. One official who worked at the Chinese embassy in Washington told me that the heated rhetoric is not taken too seriously in Beijing. While the US election is being followed in China, the focus here is the country’s own once-in-a-decade leadership transition, which will get under way next month. The move forced Ralls Corp to divest its stake in the projects, which were located near restricted airspace used by the Naval Weapons Systems Training Facility. Ralls Corp’s complaint, filed on Monday, alleged that the US president had “acted in an unlawful and unauthorised manner”. The firm, owned by two Chinese nationals, said in its suit that Mr Obama failed to adhere to the law to treat Ralls Corp on equal terms. The court documents were made public on Tuesday. 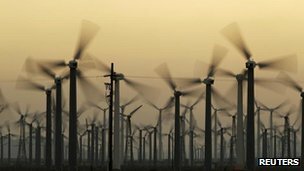 via BBC News – China firm sues Obama over blocked US wind farm deal.